Continuation o Chechnya's de facto unthirldom. The First Chechen War, an aa kent as the War in Chechnie, wis a conflict atween the Roushie Federation an the Chechen Republic o Ichkerie, focht frae December 1994 tae August 1996. ↑ 1.0 1.1 "TURKISH VOLUNTEERS IN CHECHNYA". The Jamestown Foundation. ↑ Galeotti, Mark (2014). 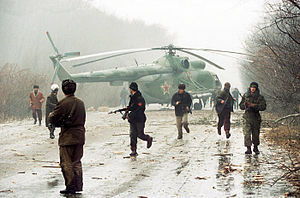 Russia's War in Chechnya 1994-2009. Osprey Publishing. ISBN 1782002790. ↑ "The radicalisation of the Chechen separatist movement: Myth or reality?". The Prague Watchdog. 16 May 2007. Retrieved 25 June 2011. ↑ Cherkasov, Alexander. "Book of Numbers, Book of Losses, Book of the Final Judgment". Polit.ru. Retrieved 2 January 2016. This page wis last eeditit on 29 Mairch 2018, at 19:19.